Charoset is a traditional Passover food that is typically a paste made from various fruits and nuts. It symbolizes the texture of mortar, which the Israelites used when they were slaves in ancient Egypt. During Passover, the charoset is one of the symbolic foods that are served. After reciting the blessings and eating matzoh, both the sweet charoset and the bitter maror (bitter herbs) are eaten to symbolize the sweet and the bitter of the holiday's history. Charoset is also eaten as a snack, spread on the matzoh. The recipe for charoset varies depending on whether it is Ashkenazi (Jews of Eastern European descent) or Sephardic (Jews of Iberian peninsula descent). Ashkenazi charoset is made from apples and chopped walnuts which are spiced with cinnamon and red wine. In fact, Ashkenazim do not recognize any mixture that does not contain apples as true charoset. Sephardi charoset is usually a paste made of dates, figs, and raisins, but no apples. Greek and Turkish Jews, however, frequently use dates, apples and other nuts. This recipe takes the best of both and includes apples, walnuts and pistachios for texture alongside dates for smoothness and sweetness. The mixture is formed into truffle balls and rolled in cinnamon sugar. Because, ultimately, charoset is meant to be sweet and delicious. Place the dates in a bowl and pour the boiling water over them. Allow to sit for one hour and then remove them from the water. Doing this will re-hydrate them and allow them to be mixed into a smooth paste. Peel, core, and small-dice the apple. You need very small pieces. Alternately, you can grate the apple on a large grater and set them in paper towels to drain excess moisture. Note that pureeing the apples in the food processor will make your mixture too wet. Add the walnuts and pistachios to a food processor and pulse a few times until you have very small pieces but not dust or puree. Remove from the food processor and set aside. Add the re-hydrated dates to the food processor and puree until smooth. Add the tablespoon or two of pear, apple, cranberry, or pomegranate juice to help the pureeing process. Add the processed walnuts and pistachios to the pureed dates, add the pinch of salt and pulse once or twice to incorporate. Add the small diced apples and pulse once or twice to incorporate. Be careful not to over-mix. Transfer the mixture to a bowl, cover with plastic wrap and refrigerate for at least 30 minutes to firm up. Add the sugar and cinnamon to a shallow bowl and stir to combine. 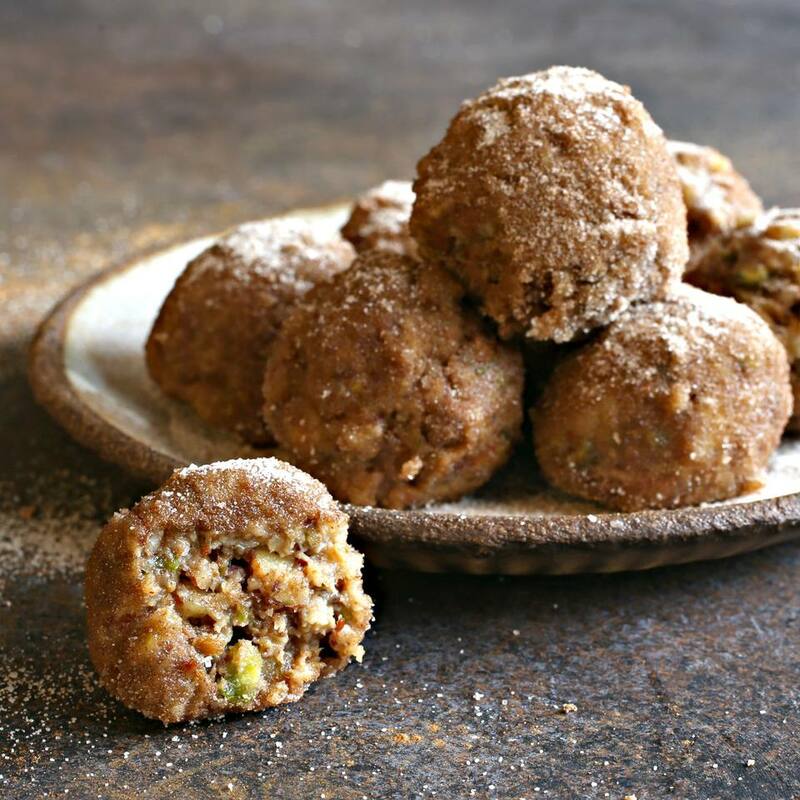 Use a 1 ounce scoop to form balls from the apple mixture and roll them in the cinnamon sugar.